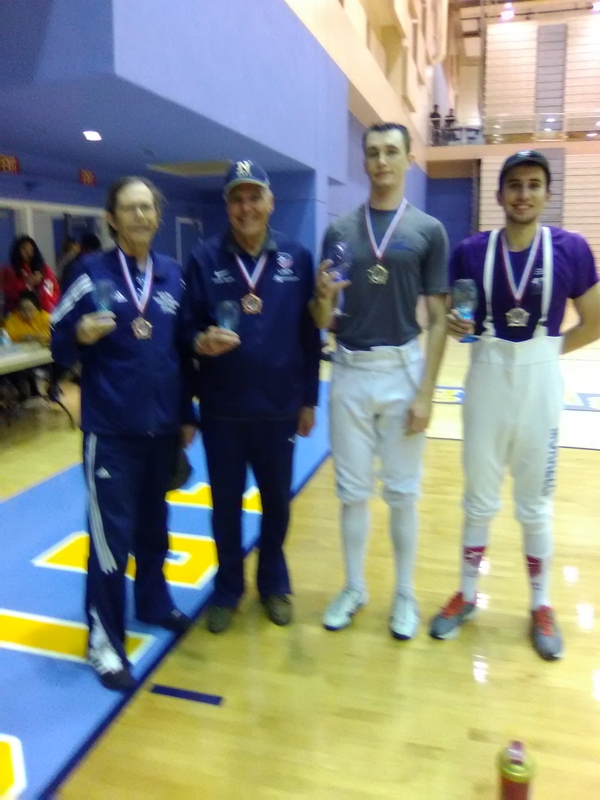 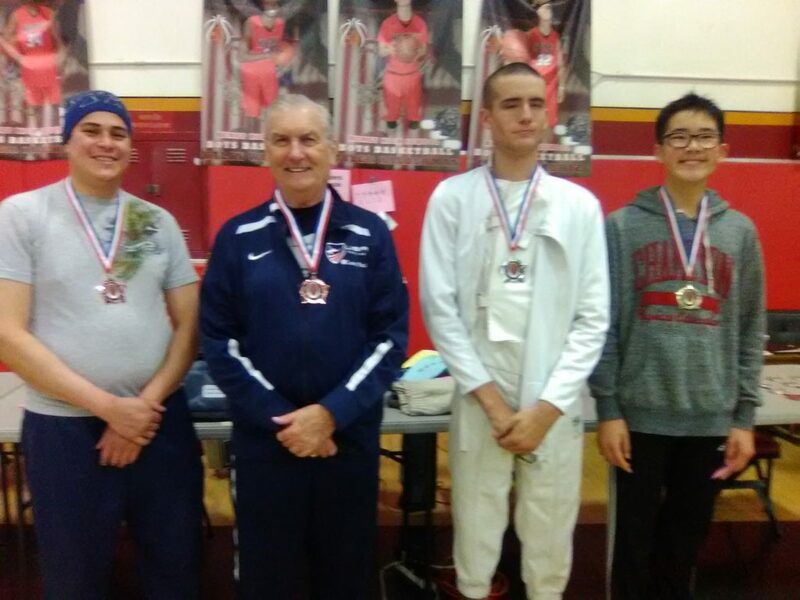 Epee: (l-r): 3rd,Bill Gelnaw (No Fear), 3rd, Frank Hewitt (Cabrillo), 1st, George Fuller (No Fear), 2nd, Kamin Morrelli (DFA). 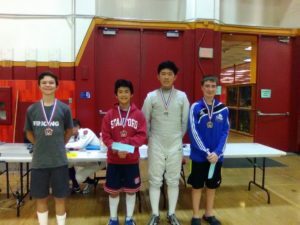 Kamin earned his B18 as well as Bill! 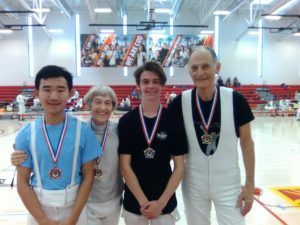 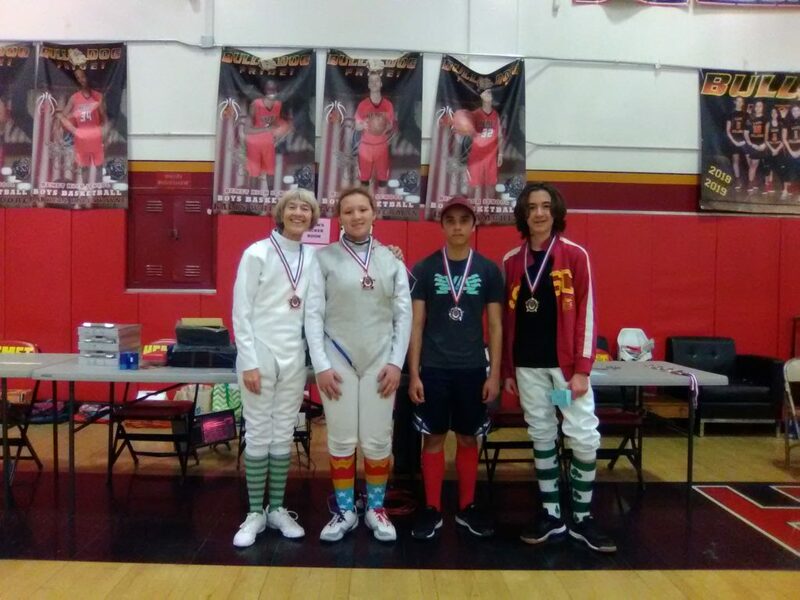 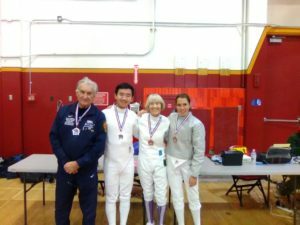 D3 Epee (l-r): 3rd, Emily Griffen (Gryphon), 1st, Eric Speicher (Conejo Fencing Club), 2nd, Brian Speicher (Conejo Fencing Club). 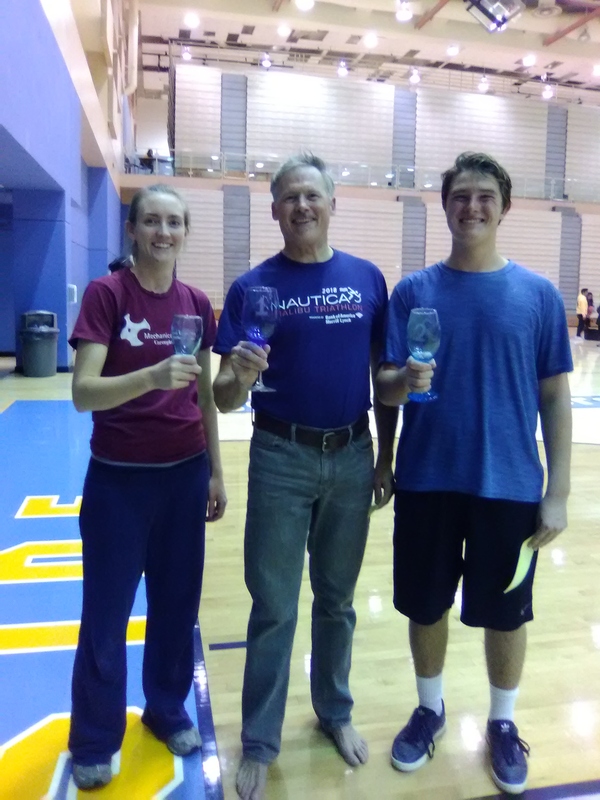 Both father and son earned their C18 and Emily her D18! 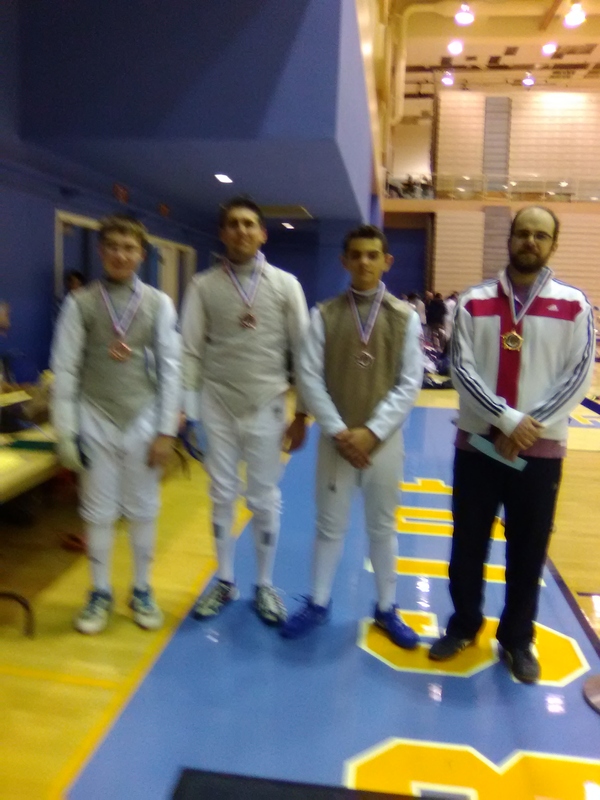 Foil (l-r): 3rd, Luke Goldade (South Coast Fencing Center), 3rd, Lucas Nichols (UCSB), 2nd, Adam Selivanov (United Fencing Academy), 1st, Andrew Stroud (Gryphon Fencing). 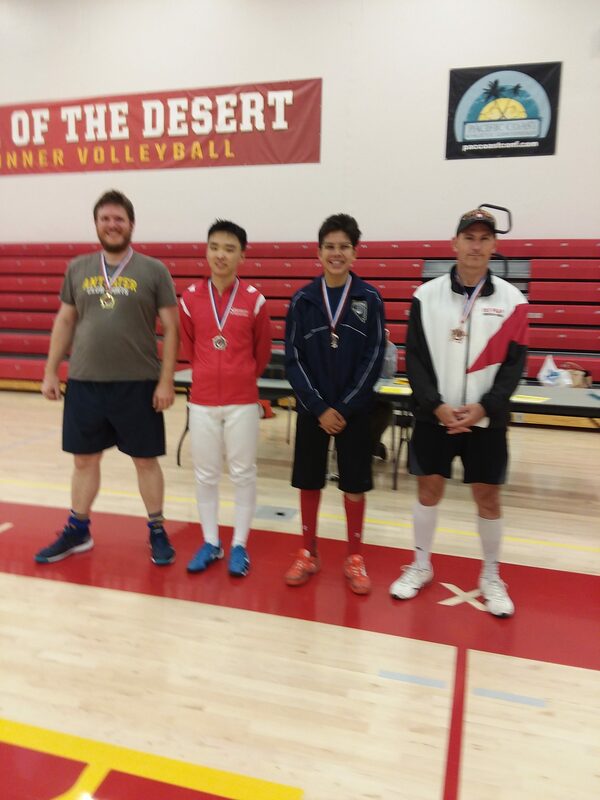 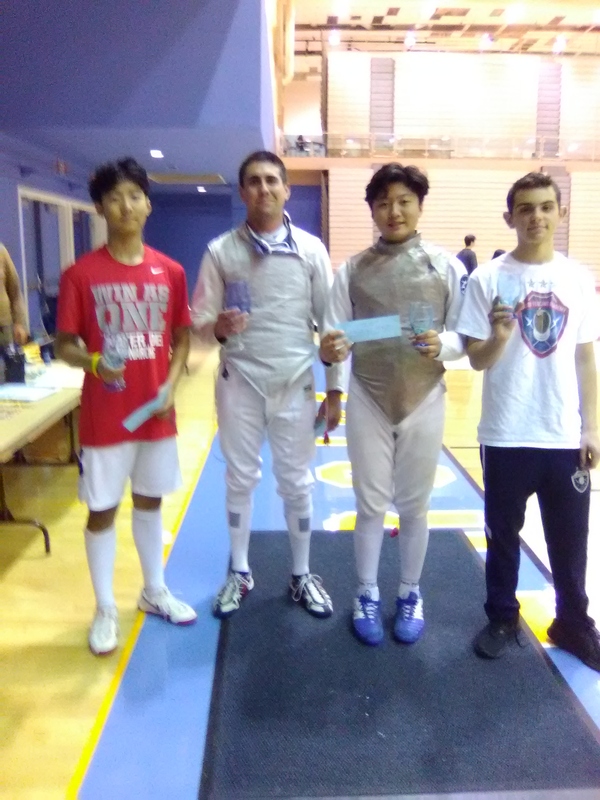 D3 Foil (l-r): 2nd, Jonas Ma (Golubitsky Fencing Center), 1st, Lucas Nichols (UCSB), 3rd, Banseok Kim (Anaheim Hills Fencers Club), 3rd, Adam Selivanov (United Fencing Academy). Jonas earned his E18, Lucas earned his D18 and Banseok earned his E18 in foil! Saber (l-r): 3rd, Jeremy Marquez (UCSB), 2nd, Linda Stroud (Gryphon Fencing), 1st, Christ McMahon (UCSB). Want to thank all the fencers who came and participated in the December 1 tournament at UCR. 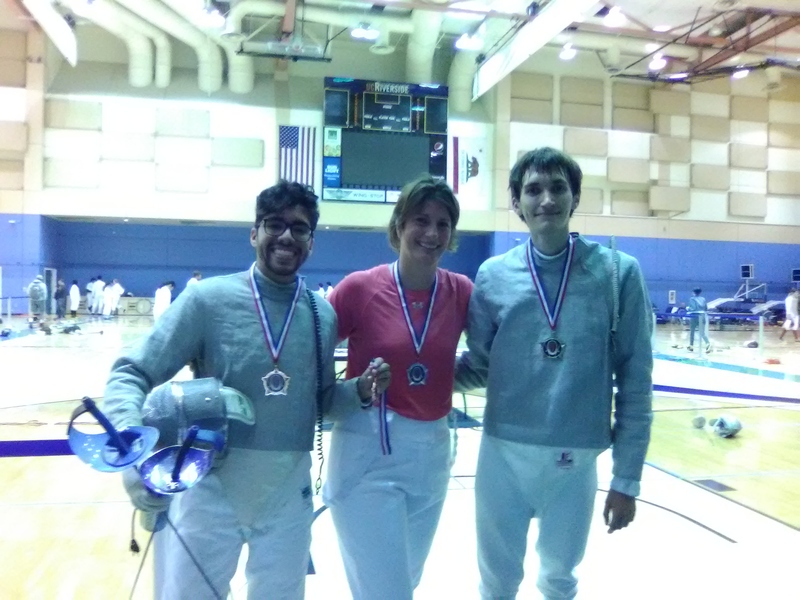 In addition to our 3-weapon open and “D” and under, UCR was also hosting an inter-collegiate event. 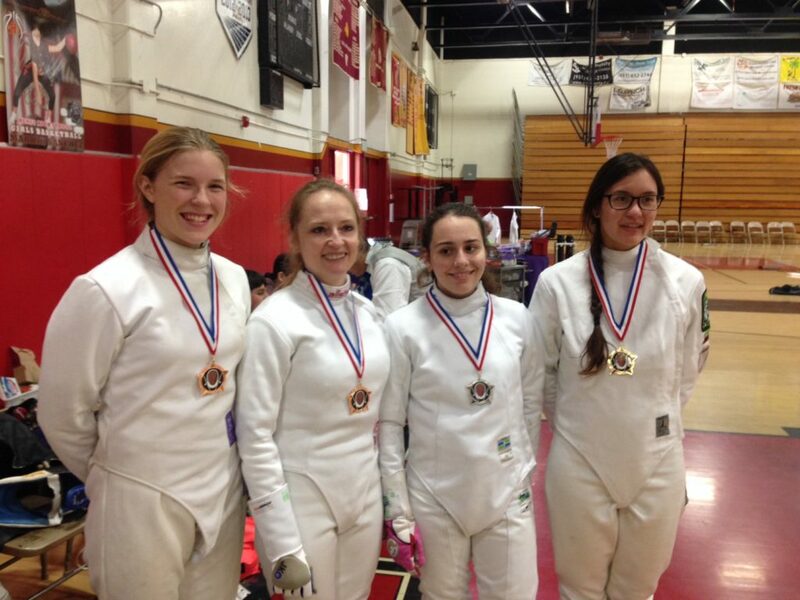 Some of the inter-collegiate fencers participated in our open events. 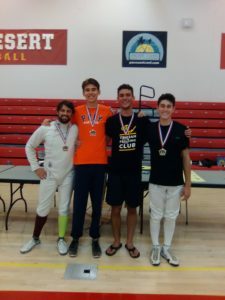 Made for some exciting competition! The Div 3 epee gold medal bout pitted father, Eric Speicher, against son, Brian. 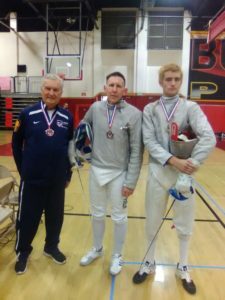 Final score, dad 15, son 12, both earning a C18. 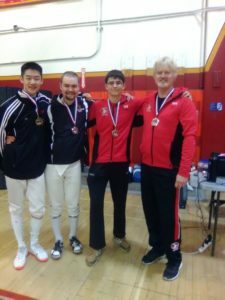 The entire assembly of fencers and spectators watched this bout! 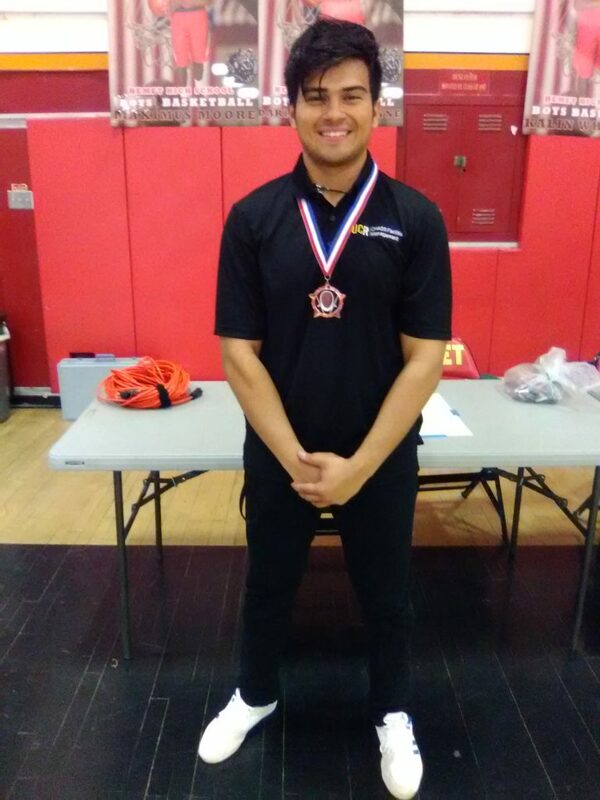 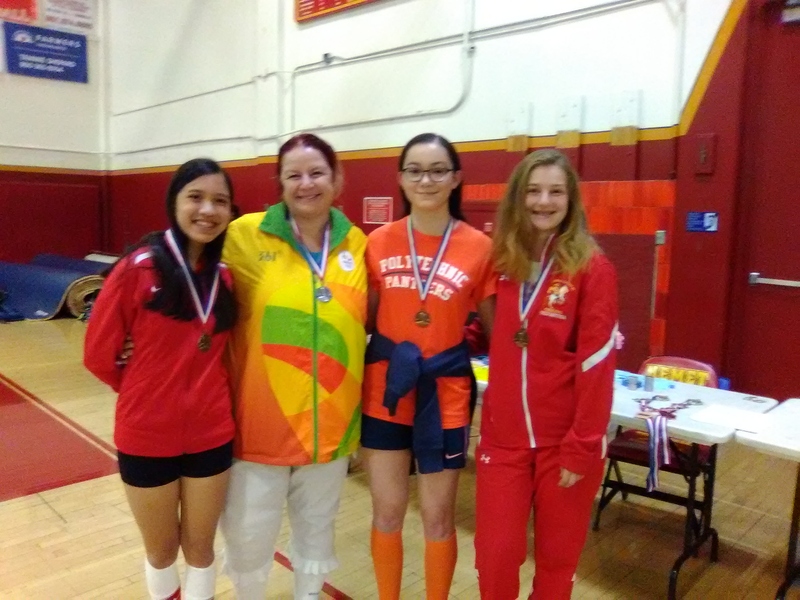 We had a large, and exciting, tournament at Hemet High School, Saturday, November 10, 2018. 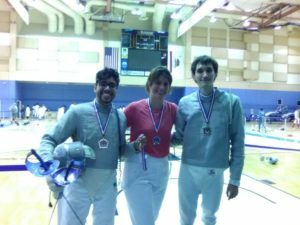 We had 82 fencers and had events in Mixed Saber, Mixed Epee, Women’s Epee, Men’s and Women’s Foil. 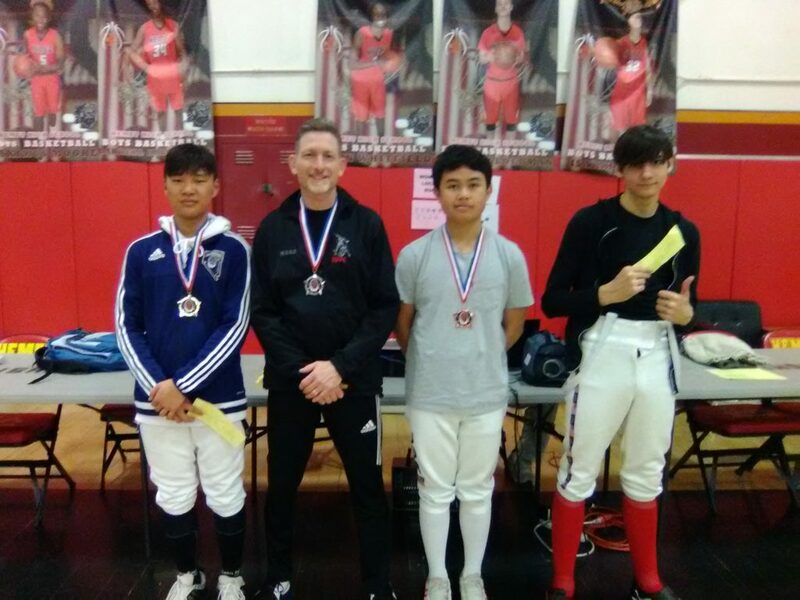 11 ratings were given out ranging from A2018 to E2018 in all weapons. Saber (l-r) : 2nd, Lucas Dobrzanski (Kern Fencing), 1st, Ian Kim (Polytechnic), 3rd, Leslie Taft (DFA), 3rd, Emily Coward (AHFC). 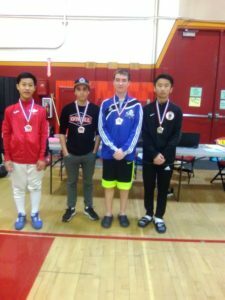 Ian earned his E2018! Women’s Foil (l-r) 1st, Devon Nguyen (AHFC), 2nd, Chris Craig, 3rd, Caroline Hashimoto (Polytechnic), 3rd, Emily Rotunda (Cathedral Catholic High School). Devon earned her E2018! Men’s Foil (l-r): 3rd, Gunnar Kaczor (Gryphon), 3rd, Ryan Li (Precision Athletics), 2nd, Justin Oh (AHFC), 1st, Luke Goldade (SCFC). 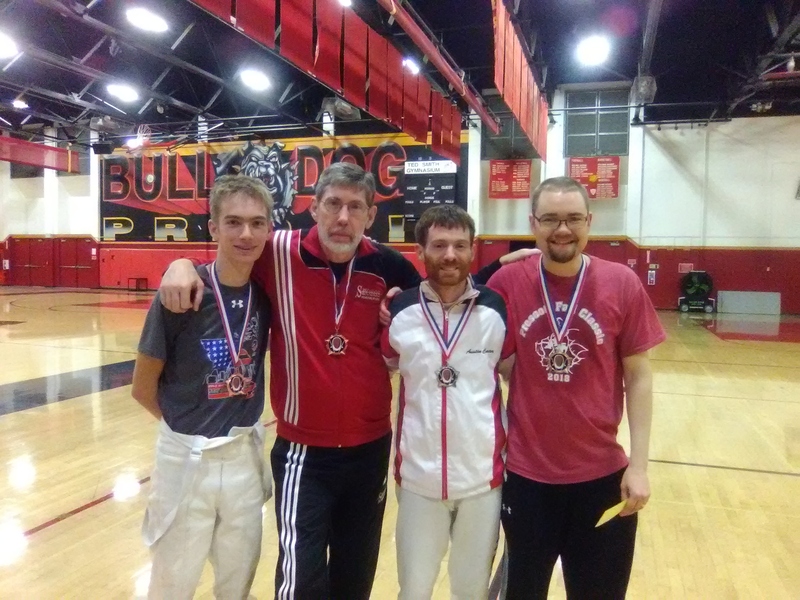 Luke earned his D2018, Gunnar and Ryan both earned their E2018! 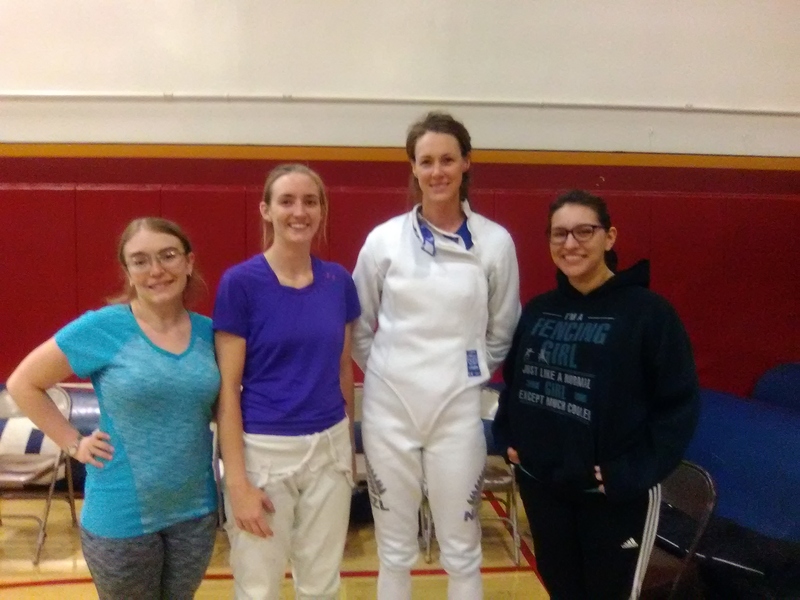 Women’s Epee (l-r): 3rd, Stephanie Fowler (Wildcat), 2nd, Emily Griffen (Gryphon), 1st, Brynn Thoreson (Battle Born Fencing Club), 3rd, Ariana Dorticos (DFA).